Railpictures.ca - John Pittman Photo: CN train 422 is passing under Oakville Sub intermediate signal 348T1 with seven engines on the head end – the first 4 are running. The BC Rail pair that Stephen Host caught powering CN 383 at Speyside three days earlier are fourth and third engines on this run. The SD75i’s that are 5th,6th, and 7th show several signs of recent attention – well-cleaned paint, some re-paint, some new radiator fans in primer, new shock absorbers and steering links in the trucks. After setting off head end cars from Aldershot East and lifting others, 422 will continue to Macmillan Yard with 802 axles ( 7 engines and 190 cars ) ! | Railpictures.ca – Canadian Railway Photography – photographie ferroviaire Canadienne. Copyright Notice: This image ©John Pittman all rights reserved. 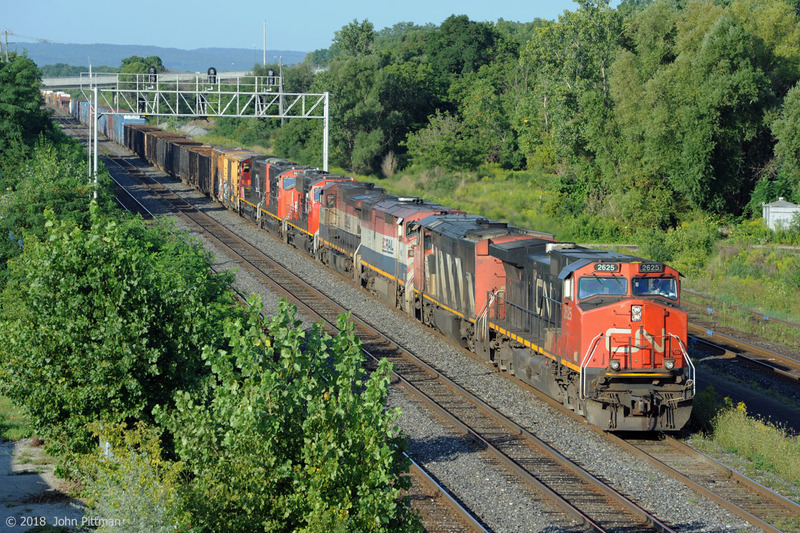 Caption: CN train 422 is passing under Oakville Sub intermediate signal 348T1 with seven engines on the head end - the first 4 are running. The BC Rail pair that Stephen Host caught powering CN 383 at Speyside three days earlier are fourth and third engines on this run. The SD75i's that are 5th,6th, and 7th show several signs of recent attention - well-cleaned paint, some re-paint, some new radiator fans in primer, new shock absorbers and steering links in the trucks. After setting off head end cars from Aldershot East and lifting others, 422 will continue to Macmillan Yard with 802 axles ( 7 engines and 190 cars ) !